Mangaluru, Feb 04, 2019: Doctors from various hospitals and Yakshagana artistes, presented a Yakshagana — “Arbudasura Garvabhangha” to create awareness on cancer among the public. The programme was organised by the Department of Hematology and Oncology, KMC Hospital, along with Lions Club Kadri Hills, Mangaluru, the Indian Medical Association, Mangaluru, and Association of Medical Consultants, Mangaluru. 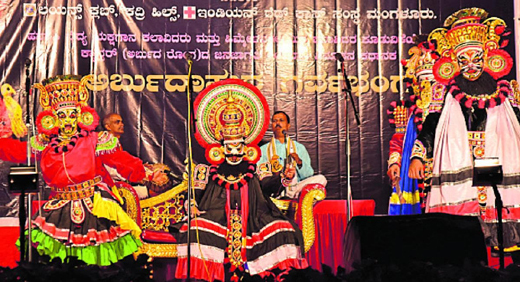 The prasanga (story) of the Yakshagana is written by Sathyamurthy Aithal, a senior surgeon and an amateur Yakshagana artiste, and Dr Annayya Kulal. Songs have been written by Nithyananda Karantha Polali. Of the 22 characters, majority of them were performed by doctors, along with amateur Yakshagana artistes. Expo at Kadri Park : As a part of ‘World Cancer Day’, the KMC Hospitals in Mangaluru created awareness on cancer through an exhibition at Kadri Park in Mangaluru. As many as 102 pictorial posters offered basic information on cancer. A team of eight doctors provided information on cancer to the visitors at the park. The pictorial posters will be placed at the park for the next three days. The posters explained all about the symptoms of cancer, treatment, life style, and food habits that cause cancer and so on.